(SitNews) Ketchikan, Alaska - Over the past four decades the Alaska Marine Highway System has looked at a variety of ways to efficiently move passengers and vehicles over Alaska's watery expanses. It has looked at larger ferries, smaller ferries and faster twin hulled catamarans. It even considered jet foils in the 1980s. The jet foils it considered would never have been able to carry vehicles or large amounts of cargo, but they would have been more than twice as fast as regular ferries and would have been able to carry more than 300 passengers on shorter runs within the system. One of the possible uses would have been to ferry large groups of students and adults to events like music festivals and regional sporting competitions. The AMHS even arranged to test jet foils in Southeast in the early 1980s, affording hundreds of residents the chance to take short trips on the speedy ships. The jet foils were approximately 100 feet long and weighed 100 tons. The jet foils were built by Boeing Marine Industries in Renton and designated as Boeing 929s by the company. Boeing used technology developed by its aircraft building division to make the jet foils aerodynamically efficient. The jet foils were designed with foils that lifted the hull of the ship out of the water, decreasing drag and allowing for the greater speeds. Initially, Boeing's first jet foils were for the Hawaiian market. Three of the original 929s began operating for Seaflite in Hawaii in 1975 and continued until Seaflite shut down in 1979. Then those three jet foils began operations for Far East Hydrofoil between Hong Kong and Macau. In the early 1980s, other companies leased Boeing jet foils for operations in Indonesia, Korea, the English Channel, the Canary Islands and Saudi Arabia. Most notably. There was regularly scheduled Boeing jet foil service between Seattle and Victoria in the mid 1980s. There was also industrial uses as companies with offshore oil rigs leased jetfoils to ferry crewmembers and supplies back and forth. The 929s were approximately 100 feet long and weighed 100 tons. Driven by twin 3,300 horsepower engines, they could reach speeds of just above 50 mph. A trip between Ketchikan and Wrangell that would take six hours on the normal ferry would take a little over two and half hours on the jet foil. In 1982, the AHMS gave Boeing a $1.2 million contract to operate jet foils in Southeast Alaska as a demonstration project. Juneau Sen. Bill Ray secured the state funding for the project. Part of the project would be making goodwill visits to places like Ketchikan, Juneau, Sitka, Wrangell and Petersburg. Those took place in the summer of 1982. And part was to provide regular service between Juneau, Haines, Skagway, Tenakee, Angoon, Hoonah and Sitka between June 16 and September 3, 1984. Fairs ranged from $18 between Haines and Skagway to $47 from Juneau to Sitka. A trip from Skagway to Sitka - with an overnight in Juneau - cost $92. The AHMS also partnered with other tour providers to set up excursion tours to Tracy Arm, the Juneau Icefield and other locations in addition to remote lodges for fishing. There was also onboard food service, part of what the jet foil called its "flight menu." A variety of sandwiches could be had for $4. The jet foil drummed up significant publicity in the communities in Southeast and, according to a story in the Petersburg Pilot in June of 1982, more than 800 Southeast residents turned out to take rides on the jet foil. Seattle based marketer/designer Robin Dale Spicer was living in Juneau in 1984 and helped promote the trials, which used a jet foil named the "Ares." Spicer went on one of the demonstration rides. "We were all poured a glass of champagne, told to stand while the jetfoil made a series of sharp turns to show our drinks wouldn’t spill and then - yowza - it made a very sharp turn to avoid a pod of orcas and, yes, drinks did spill some," Spicer remembered recently. I was on one of the tours that left the dock in Ketchikan. At least 200 locals were on board that trip which started out very much like a traditional ship but changed dramatically when it began to pick up speed and the hull came out of the water. The entire ship leaned dramatically as it circled around Pennock Island and picked up speed out into the open water of Nichols Passage. The short ride left most of the passengers wanting more. This clip shows the Jetfoil traveling across Sitka Sound. 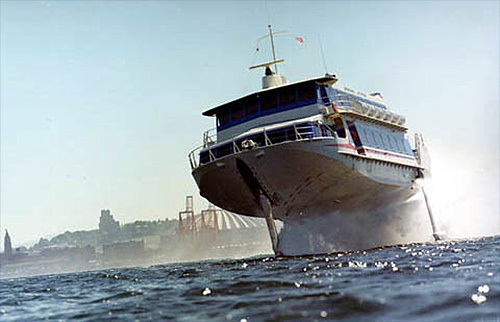 This is a demonstration of a Boeing Jetfoil hydrofoil boat which occurred sometime in 1985. The video is from our 8mm home movies of the event. I think they wanted to sell these boats to the state of Alaska, so they could be used as fast ferries between Southeast Alaska towns. They didn't wind up selling the boats, although they were very impressive and very fast! State records do not show how many Southeast residents were paying customers during the scheduled service in 1984. But the fact that the ships could not carry cargo or vehicles limited their usefulness on Southeast runs. Although the consensus of most people in the area was favorable to the jet foils, there were some concerns, mostly about what would happen if there were collisions during the high speed runs. It was feared that the foils would be damaged if the ship hit submerged logs and there was also concern about the possibility of hitting whales or other sealife. Those same concerns would come up a decade later when the state decided to purchase two fast catamarans. In an article in the Ketchikan Daily News in June of 1982, Marine Highway officials said the foils could handle striking logs up to four feet in diameter and that the maneuverability of the craft made it very unlikely it would hit a whale or any other animal. The trials schedule was designed so that all trips would take place during daylight hours, further increasing the safety margin, they said. In the end, the state decided not to purchase one or more of the $15 million craft. In addition to the inability to carry vehicles, state officials cited potentially high fuel and other operational costs. After the Marine Highway chose not to continue the trials, the air seemed to come out of much of the North American market for the jet foils, although they continue to operate at numerous locations in Asia and Europe. Kawasaki Heavy Industries took over the production of the jet foils that Boeing had developed.